Each new probe we launch into space follows a finely-tuned, predetermined trajectory that opens up a new avenue of understanding into our solar system and our universe. The results from each probe shapes the objectives of the next. Each probe is built with maximum science in mind, and is designed to answer crucial questions and build our understanding of astronomy, cosmology, astrophysics, and planetary studies. The Juno probe is no different. When it arrives at Jupiter in July 2016, it will begin working on a checklist of scientific questions about Jupiter. Jupiter is enormous. And at it’s heart is a chunk of ice and rock, or so we think. Surrounding that is an enormous region of liquid metallic hydrogen. This core is 10 to 20 times as massive as Earth’s, and it’s rotating. As it rotates, it generates a powerful magnetic field that draws in particles from the sun, then whips them into a near-light-speed frenzy. This whirlwind of radiation devastates anything that gets too close. Enter the tiny Juno spacecraft, about the size of a bus. Juno has to get close to Jupiter to do its work—within 5,000km (3,100 miles) above the cloud tops—and though it’s designed to weave its way carefully past Jupiter’s most dangerous radiation fields, its orbits will still expose it to the paper-shredder effect of those fields. There’s no way around it. The most vulnerable part of Juno is the sensitive electronics that are the heart and brains of the spacecraft. Jupiter’s extreme radiation would quickly destroy Juno’s sensitive systems, and the Juno designers had to come up with a way to protect those components while Juno does its work. The solution? The titanium vault. All kinds of materials and methods have been employed to protect spacecraft electronics, but this is the first time that titanium has been tried. Titanium is renowned for its light weight and its strength. It’s used in all kinds of demanding manufacturing applications here on Earth. The titanium vault won’t protect Juno’s heart forever. In fact, some of the components are not expected to last the length of the mission. The radiation will slowly degrade the titanium, as high velocity particles punch microscopic holes in it. Bit by bit, radiation will perforate the vault, and the electronics within will be exposed. And as the electronic systems stop functioning, one by one, Juno will slowly become brain-dead, before plunging purposefully into Jupiter. But Juno won’t die in vain. 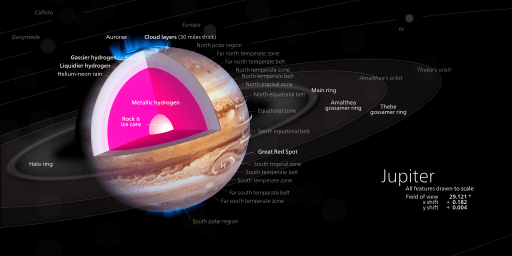 It will answer important questions about Jupiter’s core, atmospheric composition, planetary evolution, magnetosphere, polar auroras, gravitational field, and more. The spacecraft’s onboard camera, the Junocam, also promises to capture stunning images of Jupiter. But beyond all that, Juno—and its titanium vault—will show us how good we are at protecting spacecraft from extreme radiation. Juno is still over 160 million km (100 million miles) from Jupiter and is fully functional. Once it arrives, it will insert itself into orbit and begin to do its job. How well it can do its job, and for how long, will depend on how effectively the titanium vault shields Juno’s heart.